Clean and bright. Original folds visible but not obtrusive. An accurate picture of the wilderness that is known as Jackson Hole without man made features. Delineates the extreme contours of the Teton Range as well as the lakes and creeks of the entire Jackson Hole area. 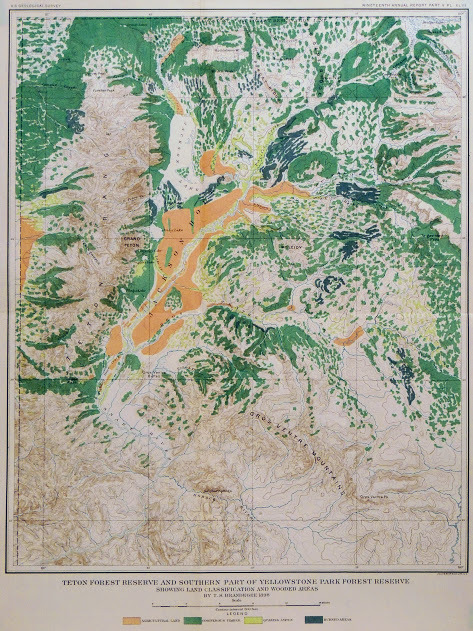 Attractively colored to identify conifers, aspens, agricultural land and burned areas shortly after the establishment of Yellowstone and several nearby reserves.